This LTD SC-208 began life as an entry level 8-string for those interested in dipping their toe in the “deep end”. The stock setup included passive humbuckers, a 3-way selector, master volume and tone control. By converting to a Flex Set the switching options expanded from 3 to 5, the frequency response was greatly extended, and the guitar shed some weight along the way. 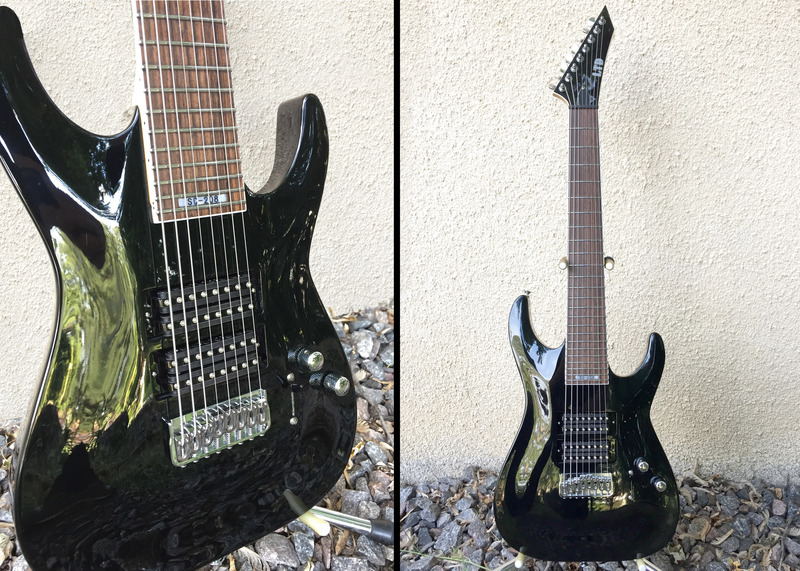 The finished guitar sporting an XR-8 based Flex Set and new Hipshot® fixed bridge. The XR-8 pickups were originally equipped with PAF baseplates. Step one was to convert them to Soapbar style bases to match the routing of the guitar. This process is detailed here. 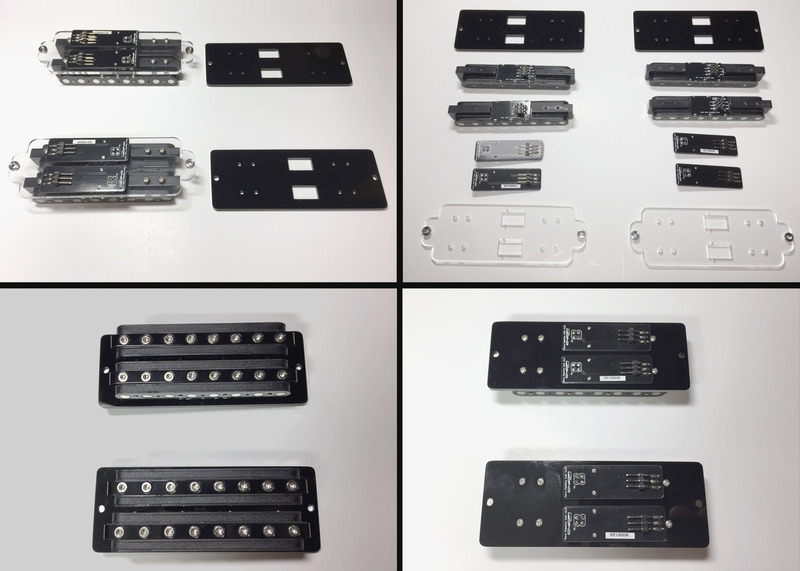 Clockwise from top left: the pickups with their original PAF baseplates alongside the Soapbar baseplates which will replace them; the pickups broken down into modular building blocks; the completed conversion shown from the rear; and front. The pickup swap went quite smoothy as the new bases fit perfectly in the routs. An unexpected detour did occur along the way however. When the string were removed from the guitar, it was discovered that a few of the stock bridge saddles were stripped where the intonation screws enter. Since we’re already making upgrades, why not upgrade the bridge? In place of the stock bridge a beautifully machined Hipshot® unit was installed which can be seen in the finished pictures above. 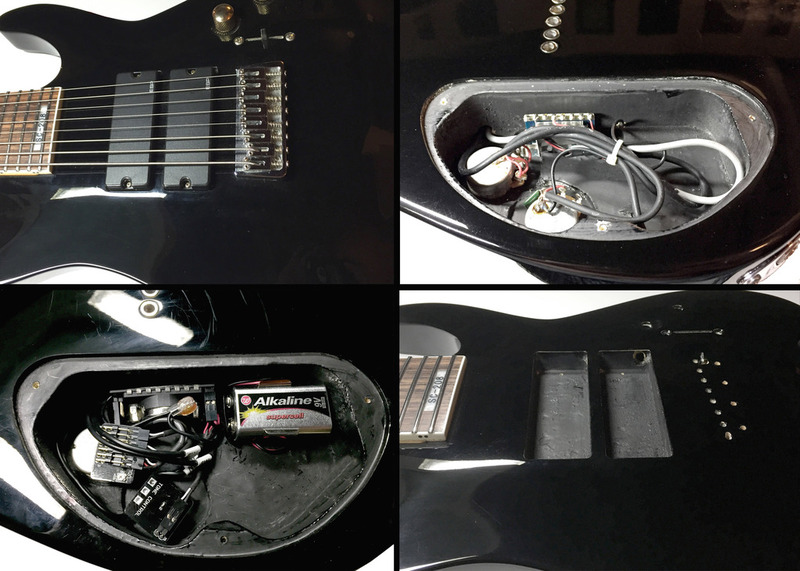 Clockwise from top left: the stock pickups and bridge; the stock control cavity; the guitar stripped of the stock system and bridge; the newly rewired control cavity. Stay tuned for sound clips of this newly XR equipped LTD.
Next post ADA4084: Can it get better than this?